Great staff!!! great location, great facilities, great balcony, curtains on every bunk ... everythings great! Niecely decorated and clean hostel! Perfect location and awsome staff! Thanks for having me! One of my favorite hostels I have been to. The staff was so helpful, I lost my passport and the owner of the hostel rode in a taxi with me to go pick it up and help by translating etc. The rest of the staff is also great. The place is clean, organized and the beds are comfy. You have unusual privacy b/c of the curtains and good lockers. Thanks!! Really nice hostel. Very clean and modern rooms. The staff is just awesome. Thank u for the great stay! Perfektes Hostel. Perfekte Lage, nette Leute, super Preis! Extrem empfehlenswert! 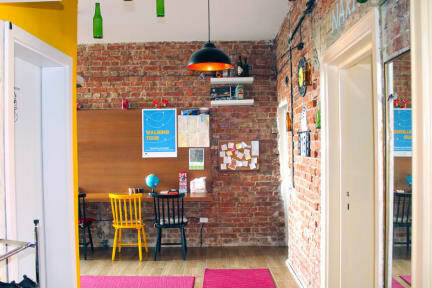 Very Cool Hostel! Nice people, open atmosphere. Ich hoffe, dass der Wasseranschluss wieder in Ordnung ist - nur das war etwas mühsam. Nice Hostel to stay in Pristina.